Protect the man and Gods from the Hrimthursar and Jotuns, and beware the creatures of the ice and fire! In the dark night, when snow is slowly falling, far away in the Jotunheim, Frost Giants called Hrimthursar are sharpening their weapons, and dreaming about conquering Asgard, Midgard, and all other worlds, where they will bring frozen winds and darkness. The 9"x11" hard cover book, 68 page, full-color. The book is lavishly illustrated, with particular attention given to the atmosphere and details of the world. Some illustrations have Celtic/Viking borders to glorify Viking's lore. This book open doors to long forgotten ancient Norse gods and giants, heroes and monsters, who inspired Vikings to great deeds. Aesir gods of Asgard and Vanir gods of Vanaheim fought against the Hrimthurses - frost giants of Jotunheim, and against the fire giants from the Muspellheim. There, Odin riding on a Sleipnir - his eight-legged steed and his two ravens Hugin and Munin, Thor wielding his mighty hammer Mjollnir - the only weapon that makes the Giants shiver. There were Valkyrie - Odin's maidens, who ride above the battlefields and take dying warriors Einherjar to Valhalla. There was monstrous Ymir - the forefather of all giants, who had risen from the fire and ice. And yes, there was Loki - the trickster god out of the race of fire giants, who is responsible for most of the bad things in this cosmos. Hel - ruler of the dead, is living in the dark, cold world of the dead called Nifelheim, where all lost souls ended up - people who didn't die in battle or some other glory death. 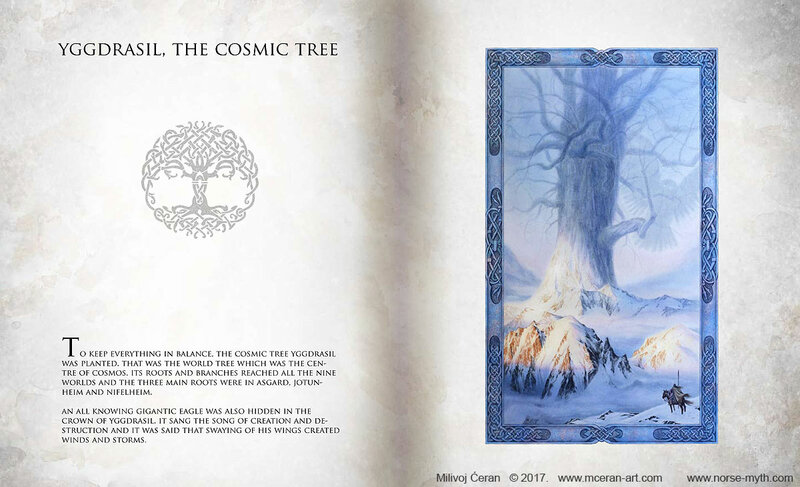 There was a colossal cosmic tree called Yggdrasil, where 9 Viking worlds were created, and creatures of all kinds lived. Trolls, dwarves, elves, giant snakes and giant wolves - all are inhabitants of 9 Viking worlds where everything is possible. Where magic is strong, and axes and swords make their own stories. 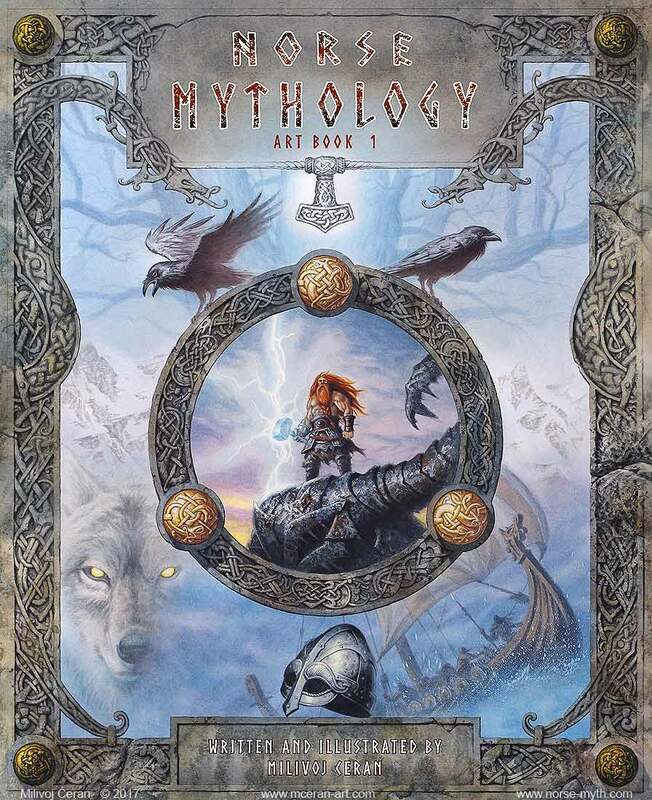 The ancient Norse myths described in this book are more than just mere stories told to overcome boredom. They epitomized the religion of our ancestors and inspired them to be brave and do great deeds. 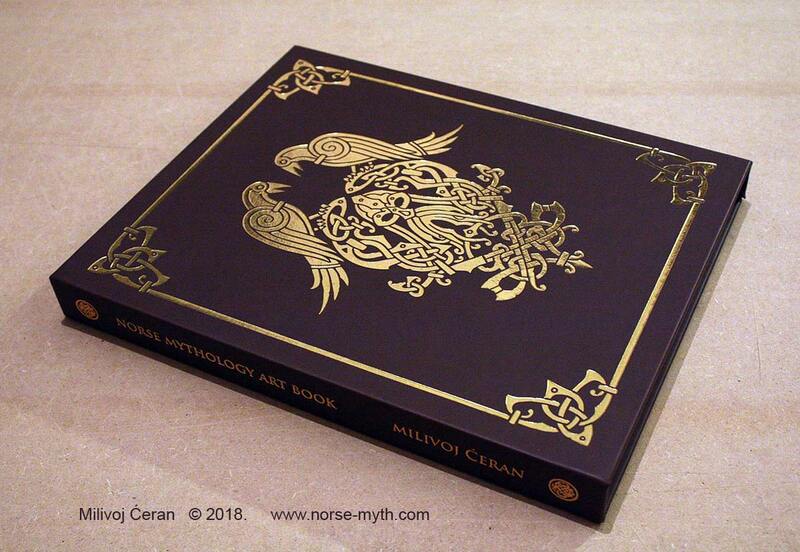 This book is closer to an "art book" than regular mythology book. The focus is on illustration and images. The text is subservient to the visual content. The images evoke the feel and mood of a lost Norse heritage, and words are just a guide to adventures. The 9"x11", 68 page, full-color book is lavishly illustrated, with particular attention given to the atmosphere and details of the world. 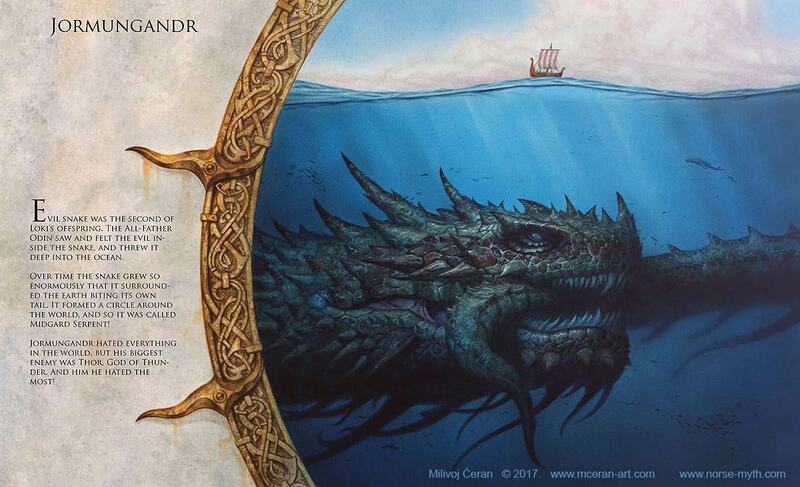 Some illustrations have Celtic/Viking borders to glorify Viking's lore. 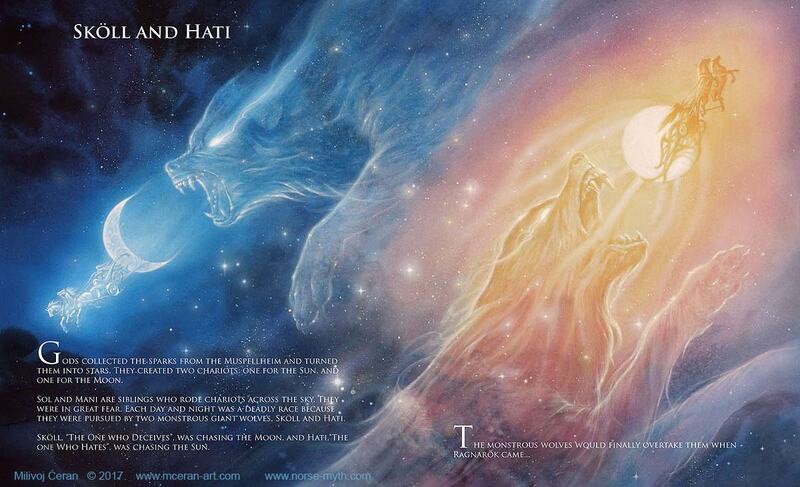 We were honored to have John Howe write the foreword for the book. Mr. Howe is an internationally famous illustrator, known for his work on Tolkien's world (Lord of the Rings, Hobbit). Additional thanks go out to Zdenko Bašić who created our amazing Kickstarter trailer. 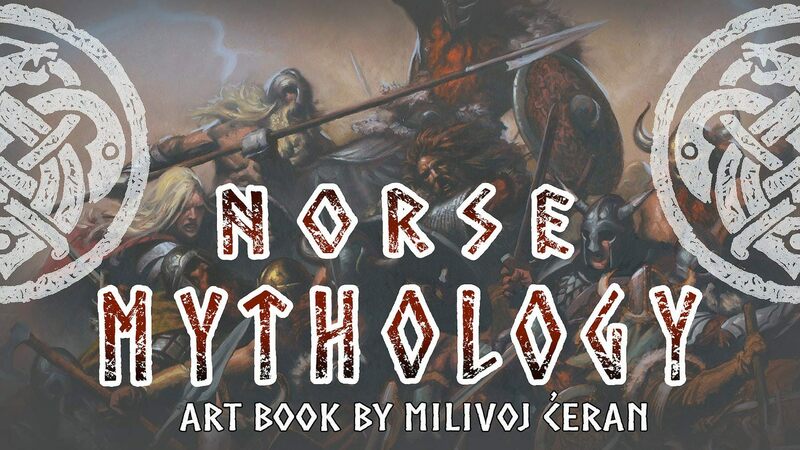 This book is going to be the first release in a series of Norse Mythology books. 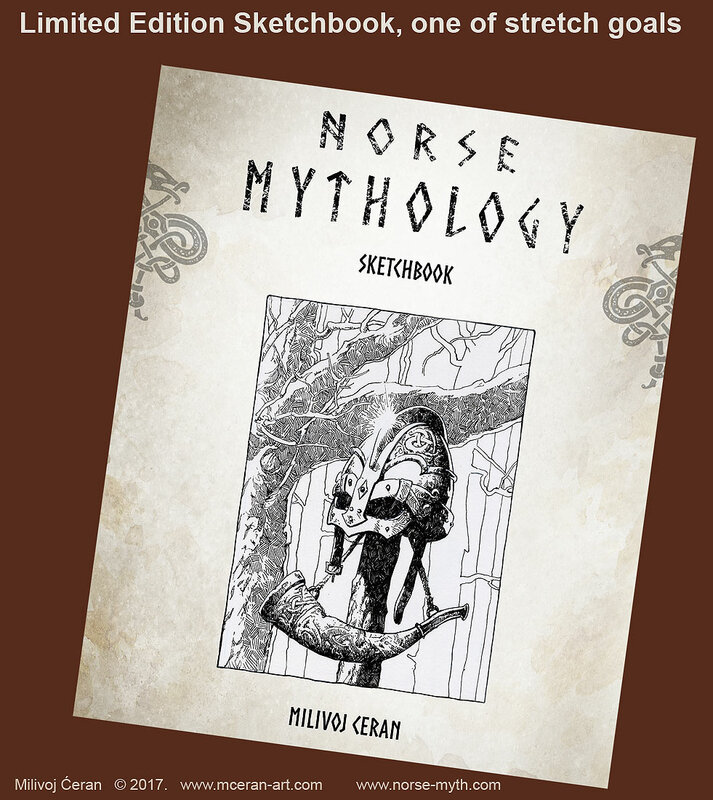 Each book will take a path to a different part of Viking's lore and explore myths, stories, and legends from the Norse cosmos. 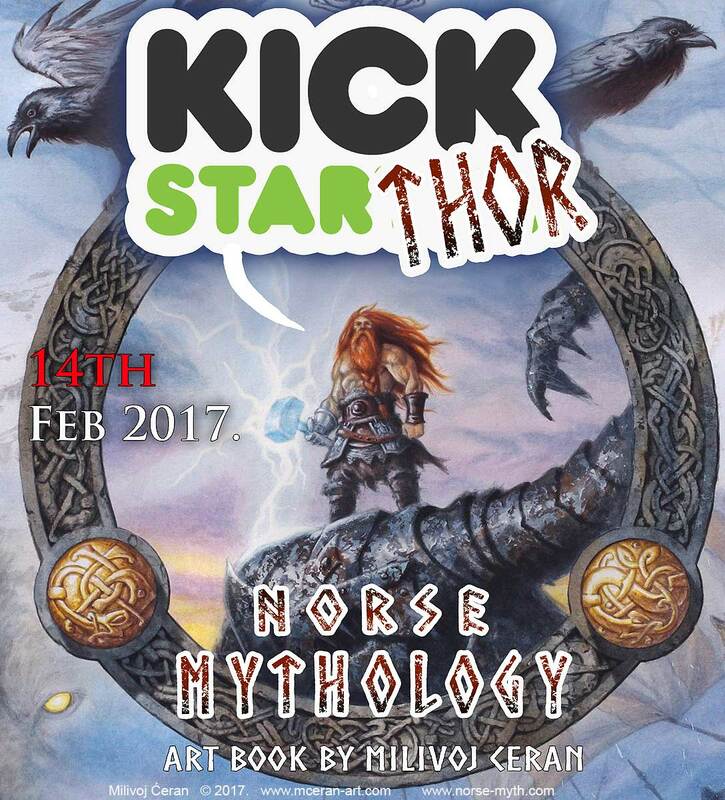 The KickstarTHOR campaign was run by Jon Schindehette/Art Order, from 14th Feb 2017 - 16th March 2017. It ended up with 1042 backers, seventy-five thousand dollars and more than one thousand three hundred books pre-sold. All 10 Stretch goals were unlocked, so beside the book, the other materials are going to be published and available. Some of stretch goals are part of making the book more unique such as: custom headbands and ribbon, gilded page edges, dust jacket with the original cover, custom matching clam shell case. There were also 2 stretch goals that were exclusively for the Kickstarter backers and aren't available any more: Deluxe hard cover leather limited edition of the book, and numered bookplate. After only first few days of the successful campaign, the project receive labels: "Project we Love" (Kickstarter), "Featured Project, Feb 2017." (Pledgewithshare.com) and Top 3 Projects of the Day" (Kickstarter).